While the hot, dry weather across the Midwest has affected soybean production, it has also negatively affected soybean diseases. In general, there is very little disease across Iowa in soybean. There have been a few fields with Septoria brown spot and Cercospora leaf blight, but it has been a quiet year for soybean diseases. That has not stopped the questions about foliar fungicides. With the price of soybean and fields being sprayed for spider mites or Japanese beetles, questions around "throwing in a fungicide" have been coming in. Through funding from the soybean checkoff, we have completed 21 site years of trials looking at the responses to fungicides, insecticides and tank mixes of fungicides + insecticides. Except for a few site years, the soybeans have been mostly disease free. And many of the locations have had little or no insect pressure. One thing is for certain, none of the previous trials have had any inkling of drought stress. Really, the only environmental stress we have seen in previous fungicide trials is too much moisture. Table 1 summarizes the response to fungicides and fungicides + insecticides. The products summarized in Table 1 include a strobilurin fungicide, which are Headline, Stratego YLD and Priaxor. The addition of a fungicide to an insecticide application has resulted in a lower yield response of 1.7 bu/ac. Table 1. Mean yield response of fungicides alone (vs. control) and fungicide-insecticide tank mixes (vs. insecticide alone) applied at growth stage R3 in trials from 2008-2011 in Iowa. Table 2 summarizes the economic response at $10 and $16 per bushel. Even considering a lower total application cost for fungicides as part of a tank mix, fungicides "thrown in" with insecticides only have a 46 percent chance of getting an equal return on your investment. Table 2. Economical analysis of fungicides applied alone and fungicides mixed with insecticides at growth stage R3 in studies conducted in Iowa from 2008-2011. Analyses are based on grain prices at $10 and $16 per bushel. A final thought on fungicides: Remember to scout for frogeye leaf spot if you have made a fungicide application. We are monitoring for fungicide resistance for the frogeye leaf spot pathogen so if you suspect you have it, please send samples to our Plant and Insect Diagnostic Clinic. Even with rain last night across much of the state, one soybean disease that may be showing up is charcoal rot. Charcoal rot is caused by the fungus Macrophomina phaseolina. Infection can occur early in the growing season, yet symptoms may not become evident until mid- to late-season. There are a few characteristic symptoms to distinguish charcoal rot from other problems. Microsclerotia (see Figure 1) are probably the most characteristic sign. These structures are very dark and round and are how the fungus survives. 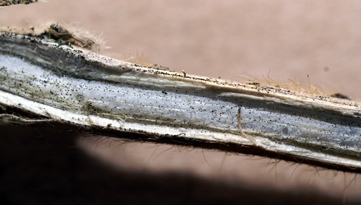 The fungus infects roots and moves to stems, filling tissues with microsclerotia, which clog vascular tissue, causing wilting, yellowing, and stunting of the plant. And this is much more apparent in drought-stressed areas. A second characteristic is gray discoloration when you split the lower stems (Figure 2). Figure 1. Black fungal structures called microsclerotia can be found in stem tissue infected by the fungus that causes charcoal rot. Photo by Alison Robertson. Figure 2. 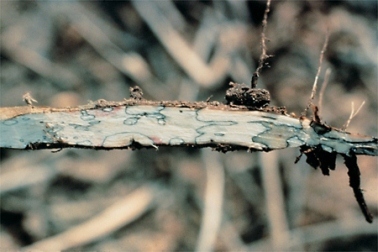 Gray discoloration of stems is symptomatic of charcoal rot. Photo by XB Yang. Even with these two signs of charcoal rot, this disease may still be hard to diagnose because general symptoms are similar to drought stress. As for management, foliar fungicides are not effective. The microsclerotia can survive for several years, so cultural practices are not effective. There is a limited selection of resistant cultivars and planting at lower populations to reduce competition for water among plants can help. Daren Mueller is an extension specialist in the Department of Plant Pathology and Microbiology. He can be reached at 515-460-8000 or e-mail dsmuelle@iastate.edu. Nate Bestor is a research associate in the Department of Plant Pathology and Microbiology. He can be reached at 515-294-1741 or e-mail bestor@iastate.edu. Links to this article are strongly encouraged, and this article may be republished without further permission if published as written and if credit is given to the author, Integrated Crop Management News, and Iowa State University Extension and Outreach. If this article is to be used in any other manner, permission from the author is required. This article was originally published on July 26, 2012. The information contained within may not be the most current and accurate depending on when it is accessed.